The reinforcing wire mesh welding mesh machine produced by Jiaoyang uses synchronous control technology, and the welding and welding time is controlled by the PLC digital programming system. The input panel is two touch screens or buttons. The operation is more intelligent and reasonable, and has the characteristics of primary pressure and secondary welding. 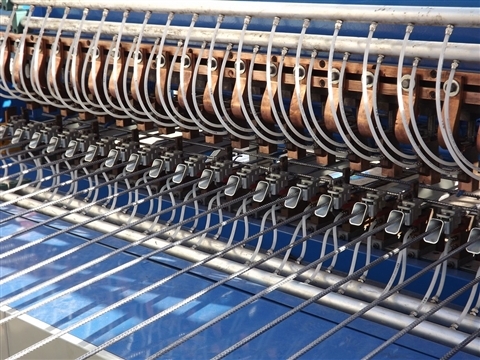 The electrodes of the reinforcing wire mesh welding mesh machine are widely used in the processing and manufacturing of various forms of products for home appliance products, daily hardware, transportation, electrical appliances, electronics, batteries, instruments, meters and other hardware accessories manufacturing. It can be used for spot welding and projection welding of carbon steel, stainless steel, coated steel and various non-ferrous metals such as plates, wires, pipes, screws and nuts. 1.The welding power supply of this machine is electric, adopting stepping mode. 2.The brake motor drives the trolley, and the stepper motor drives the trolley to pull the net. 3.Both warp and weft are cut by a straightener. 4.The wire feeder is easy to adjust. 5.The horizontal hopper is mounted on a movable grid for easy adjustment and maintenance. 6.The pulling part is driven by a stepper motor, which can set a variety of cross line spacing on the same grid. The net hooks use clamping devices to make the grid space more precise.